Crews battling the biggest wildfire on record in California have made some progress but the weather forecast for the rest of the week is not promising, authorities said Wednesday. It will remain very hot and windy -- conditions that help fire spread -- until at least Saturday evening, the National Weather Service office in the state capital Sacramento said late Tuesday. "Smoke and haze will continue to impact #norcal. Warmer temperatures and increasing fire weather concerns late this week," the agency said. 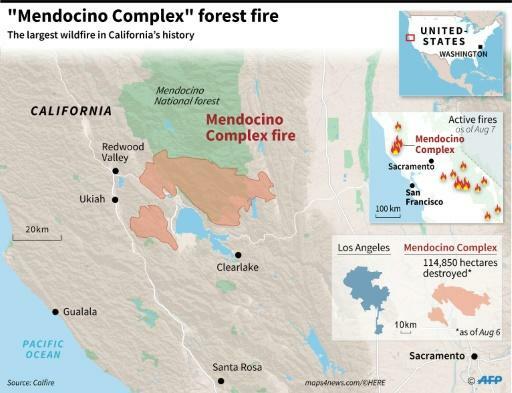 The raging Mendocino Complex fire, comprising twin blazes in the state's north, has now ravaged just over 300,000 acres (120,000 hectares) -- approximately the size of Los Angeles -- in less than two weeks. On Monday it became California's largest wildfire since record-keeping began a century ago. 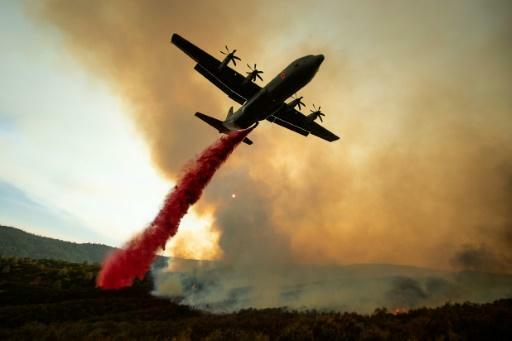 Some 14,000 firefighters, including reinforcements from as far away as Australia and New Zealand, are combating the firestorm which remains 47 percent contained, the state agency Calfire said in an update at 1400 GMT. That's up from 34 percent 12 hours earlier. The River Fire of the Mendocino Complex is 81 percent contained, having burned 48,920 acres. But its partner blaze, the Ranch Fire, has grown to 251,000 acres and is just 46 percent contained. A shift in the weather can make a big difference for firefighting crews. "Weather was a big factor today and due to the winds aloft covering the fire area in smoke, it caused lower than predicted temperatures," Calfire said Tuesday evening. "The temperature decrease allowed crews to continue valuable work to contain the fire perimeter edge, slowing fire growth," it added. Crews used the lower temperatures to increase containment lines. Overall, the Mendocino Complex fire has destroyed at least 221 structures, 116 of them residences. More than 10,000 other structures are threatened, according to CalFire. Two people have died in that inferno alone, taking to 11 the number of people killed by major fires that are becoming something of a constant in the state. The Carr Fire to the north, near the town of Redding, has meanwhile engulfed more than 173,000 acres since igniting July 23, killing seven people so far. 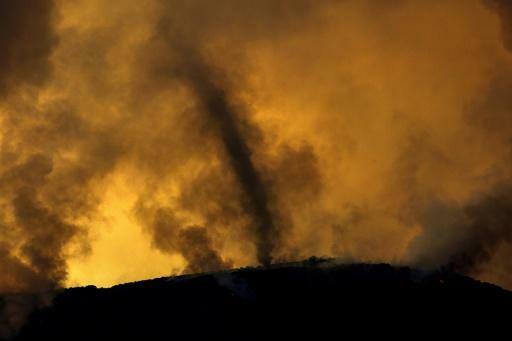 As of early Wednesday firefighters had managed to get it 47 percent contained. Another major fire, Ferguson, has left two people dead and forced the closure of part of the Yosemite National Park. It is currently 43 percent contained. In California tens of thousands of people have been forced from their homes over the past month although some have now been allowed to go back. In the state's south near San Diego, hundreds of personnel have deployed to tackle the fast-moving Holy Fire in the Cleveland National Forest. On Monday, the Pentagon said it would send 200 soldiers to assist firefighters in fending off the flames across western states. About 1,000 National Guard personnel are supporting wildfire operations in California, with another 450 in Oregon and 170 in Washington state, it added.